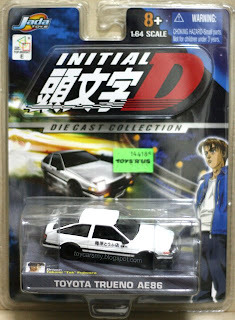 This one of my favorite collection, Initial-D Trueno AE 86 produced by Jada Toys in 2006. Together with this Initial-D collection, there are few others cars from the famous Intitial animation series are Nissan Sil-Eighty, Nissan Skyline GTR R32, Mazda RX-7 FD3R, Mazda RX-7 FC3S and Mitsubishi Lancer Evolution III. If you don't mind, how much do the car cost you? Interested to have one...Already had 2 Jada Toys Volkswagen GTi..
where can I buy I need asap. for boyfriend bday??? ?